New Delhi, India: As the largest consumer and importer of palm oil, globally, India has the potential to play a significant role in driving sustainable practices in the palm oil sector. In order to address this, Sustainable Palm Oil Coalition for India (India-SPOC) was recently launched as a collaborative effort between Centre for Responsible Business (CRB), World Wide Fund for Nature (WWF) – India, Roundtable on Sustainable Palm Oil (RSPO) and Rainforest Alliance (RA) at a global convention on sustainable trade and standards in New Delhi. In recent years, palm oil has become one of the most widely used vegetable oils in the food and FMCG industry, given its productivity and versatility in use. However, the factors that have made palm oil a success have also brought with it well-documented environmental and social challenges. Most prominent among these are links to deforestation, labour rights, and damaging effects on nature and the environment, particularly when grown unsustainably. 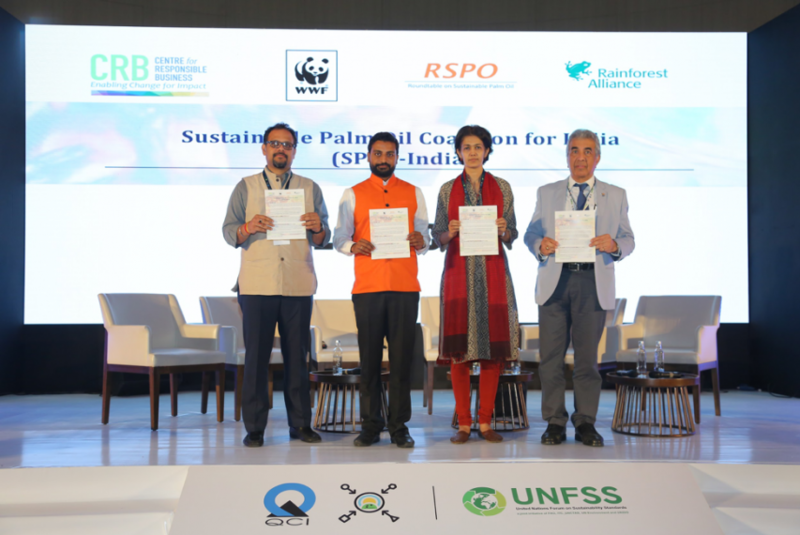 India-SPOC will be working primarily with companies in India to facilitate collaboration within the industry and help improve sustainability performance across their palm oil supply chain. The coalition will work towards addressing barriers and challenges to sustainable palm oil by taking into consideration the unique characteristics of the palm oil sector in India, focusing on aspects including policy, best practices for production, trade linkages, and consumer sensitisation to sustainability. The collaborative platform will consist of associations, civil society organisations, consumer goods manufacturers, food-service retailers, retailers, banks and financial institutions, and palm oil traders and producers committed to increasing the use of sustainable palm oil and its derivatives in the Indian market. India-SPOC has opened its request for stakeholder participation with CRB playing the role of the Secretariat for the coalition. "The formation of India-SPOC is a timely and positive development in India and for the Asian region. I believe India-SPOC, to a great extent, will address the concerns and doubts of scholars and critics who argue that the increase in South-South trade in food, feed and fibre, for which India is a leading actor for both imports and exports, may undermine sustainability issues. I am sure India-SPOC will develop appropriate strategies, plans and activities for proactive engagement with palm oil producers, processors, users and other stakeholders in the value chain to address and arrest the challenges of deforestation, biodiversity loss, human and labour rights in palm oil industry in India and the region. Many congratulations and my best wishes to the leaders at Rainforest Alliance, RSPO, WWF and CRB for initiating and leading this initiative." The Centre for Responsible Business (CRB) is an independent centre of excellence, working with business and stakeholders to promote responsible business strategies, policies and practices. For more information please visit, http://www.c4rb.org/. WWF-India is a leading conservation organisation with a global network active in more than 100 countries dedicated to building a world in which humans live in harmony with nature. For more information please visit, www.wwfindia.org. The Roundtable on Sustainable Palm Oil (RSPO) was formed in 2004 with the objective of promoting the growth and use of sustainable oil palm products through credible global standards and engagement of stakeholders. For more information, please visit RSPO’s global website www.rspo.org. The Rainforest Alliance is an international nonprofit organisation working to build a future in which nature is protected and biodiversity flourishes, where farmers, workers, and communities prosper, and where sustainable land use and responsible business practices are the norm. For more information please visit, www.rainforest-alliance.org/.